Note: You don’t need to complete the TP-1029.RE-V form if you received one or more advance payments of the tax credit or you claimed all of your eligible expenses for 2017 as advance payments. You can find the advance payments amount in box H of your RL-19 slip. 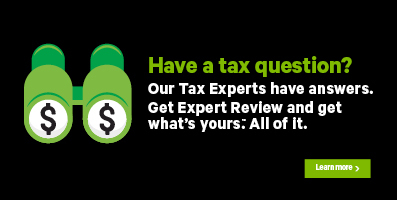 H&R Block’s tax software will automatically carry this amount to line 441 of your tax return. The tax credit has 2 parts to it - the post-disaster clean-up and preservation component and the repair component. To claim your repair expenses only, you must have an expert’s damage assessment report describing the damage caused to the residence. Note: If you’re claiming both components of the credit, or if only some of your repair work is recognized under the credit, your contractor must give you a breakdown of expenses for the different types of work carried out. The post-disaster clean-up and preservation portion is equal to 30% of the eligible expenses over $500 you paid in 2017 to have recognized clean-up or preservation work done. The maximum you can claim under this component is $3,000, provided the expenses were paid by December 31, 2017. The repair portion is equal to 30% of the eligible expenses paid before January 1, 2019. The maximum credit available under this component is $15,000, provided the expenses have been paid by December 31, 2018. Keep in mind, for 2017, you can only claim the expenses you paid in 2017. Before you begin, make sure that you told us that you lived in Québec on December 31, 2017. Under the SPECIFIC CREDITS FOR YOUR PROVINCE heading, select the checkbox labelled, Tax credit for the restoration of a secondary residence (TP-1029.RE-V), then click Continue. When you arrive at the Credit – secondary residence (QC) page, enter your information into the tax software. In this section, you’ll enter information about the other owners of the property. For example, if you own the residence with your spouse, enter his or her information here. You and your spouse can split this credit if you both owned the property when the floods damaged it and when the expenses were paid. Both you and your spouse will need to complete this page in your returns. Licence number – This is the licence number that’s been issued to the contractor by the Régie du bâtiment du Québec, the Corporation des maîtres électriciens du Québec or the Corporation des maîtres mécaniciens en tuyauterie du Québec. Total amount of eligible expenses for this work (including tax) – Refer to Revenu Québec’s website for a full list of eligible post-disaster clean up and preservation expenses. However, don’t include the cost of any permits in this field. You’ll enter the cost of permits (and studies to obtain them) in another section on this page. Licence number - This is the licence number issued that’s been issued to the contractor by the Régie du bâtiment du Québec, the Corporation des maîtres électriciens du Québec or the Corporation des maîtres mécaniciens en tuyauterie du Québec. Total amount of eligible expenses for this work (including tax) – Refer to Revenu Québec’s website for a full list of eligible repair expenses. However, don’t include the cost of any permits in this field. You’ll enter the cost of permits (and studies to obtain them) in another section on this page. Total amount paid in 2017 (codes 1 to 13) – Enter the total amount you paid in 2017 for components with codes 1 to 13 on which recognized repair work was done. Refer to Revenu Québec’s website for a list of these components and their related codes. Total amount paid in 2017 (codes 14 to 16) - Enter the total amount you paid in 2017 for components with codes 14 to 16 on which recognized repair work was done. Refer to Revenu Québec’s website for a list of these components and their related codes. This amount can’t be more than $5,000 for the property. How much are the other owners of the secondary residence claiming for post-disaster clean up and preservation expenses on their Québec return (line 462)? – Enter the total amount of post-disaster clean up and preservation expenses the other co-owners are claiming on their return. This amount is shown on line 462 (point 34)of the co-owner's 2017 Québec return. Note: If one of the co-owners is your spouse, you can find this amount on his or her PDF tax return on the Tax Summary page in H&R Block’s tax software. How much are the other owners of the secondary residence claiming for repairs on their Québec return (line 462)? – Enter the total amount of repair expenses the other co-owners are claiming on their return. This amount is shown on line 462 (point 34)of the co-owner's 2017 Québec return.